Today we welcomed Maggie Morris to our gathering at Ty Golchi. 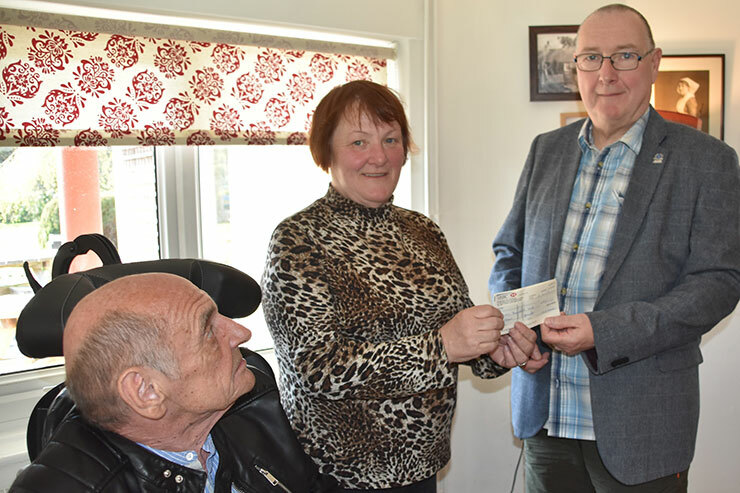 She handed a cheque for £800 to our Treasurer, Bill Griffiths, in memory of her dear daughter Anwen Gibson of Dwygyfylchi. 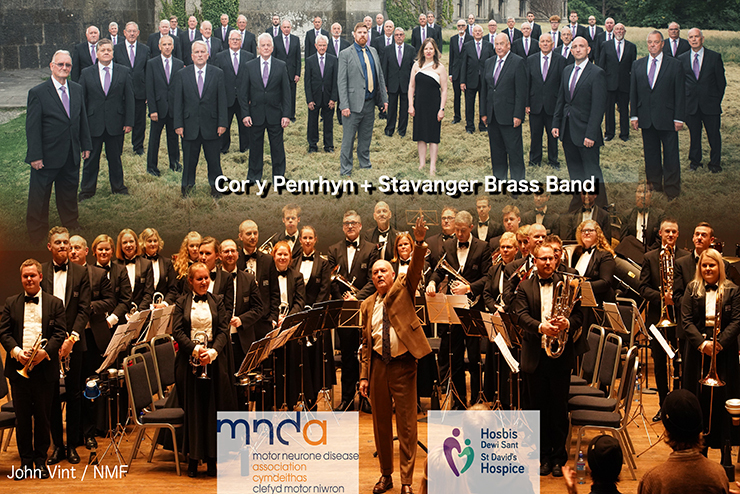 At 7pm on Saturday 1st of June at Bangor Cathedral the Stavanger Brass Band and Côr y Penrhyn male voice choir will perform at a charity concert for the Motor Neurone Disease Association and St Davids Hospice. This promises to be a very good evening's entertainment. The Stavanger Brass Band from Norway has been successful in a number of brass band competitions in Europe, while Côr y Penrhyn, with its roots in the slate quarrying village of Bethesda in the Ogwen Valley, are famous for their accomplished performances of old favourites and contemporary pieces. Click here for tickets which cost £10. 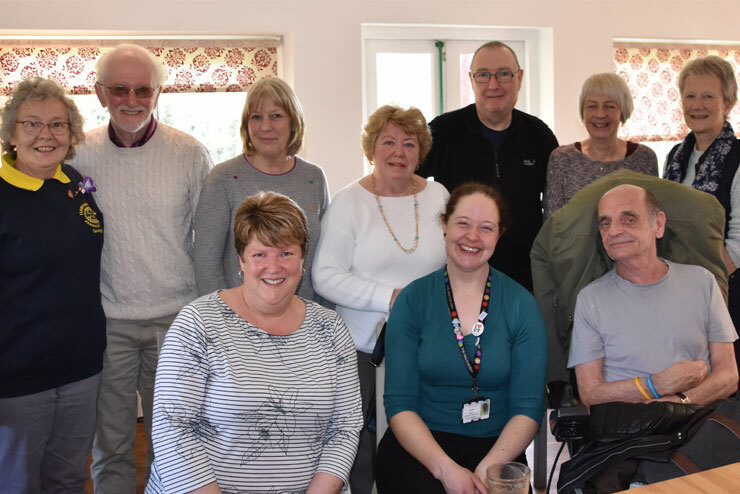 At our March meeting we were pleased to welcome Suzanne Simpson from the Walton Centre. She is visiting a number of groups and branches in her role as MND Psychological Well-being and Social Support Advisor. Suzanne is seated in the middle of the front row with our chair Roger Sowersby on the right. 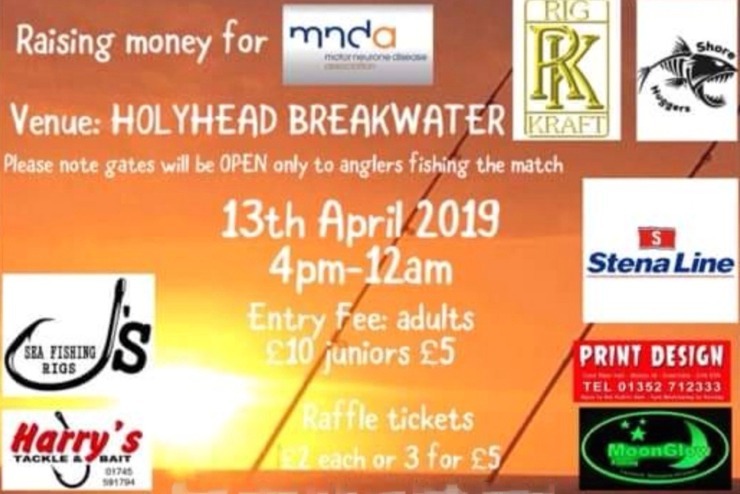 Calling all fishermen - here is an opportunity to take part in a fishing competition AND raise money for the MND Association! 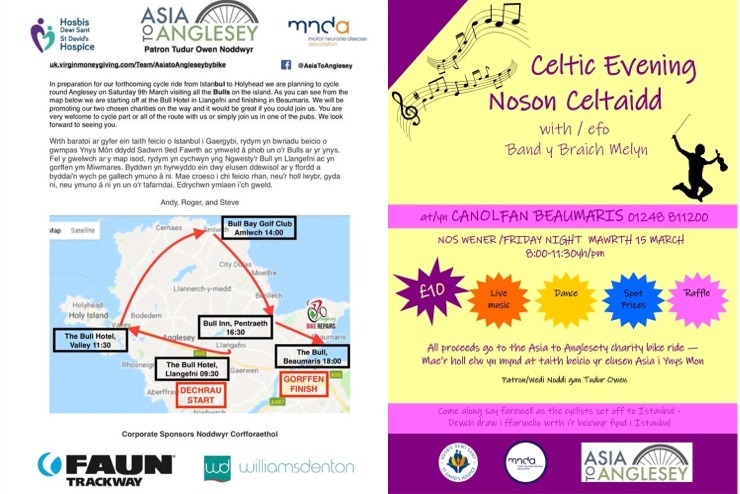 Asia to Anglesey have arranged two fun events next month before they fly off to Istanbul. The first is on Saturday 9th March and is a cycle tour of all the Bull Inns on Anglesey. You are very welcome to cycle all or part of the route with Steve MacVicar, Andy Fowell and Roger Thomas, or you can join them in one of the pubs where they would be glad to meet you. The second event is a Celtic Music evening with Band y Braich Melyn at Canolfan Beaumaris on Friday 15th March. There will be live music, dance, spot prizes and a raffle. Entrance costs £10. 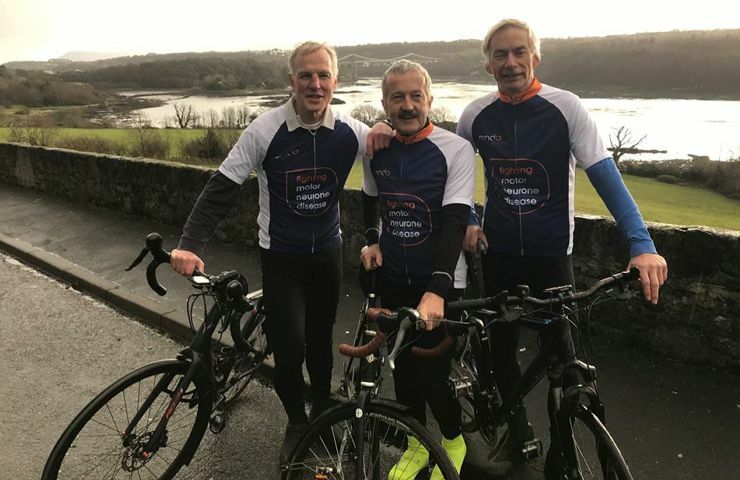 On the 28th March 2019 Steve MacVicar, Andy Fowell and Roger Thomas will fly to Istanbul, Turkey and spend the next eight weeks cycling home across Europe to Anglesey. 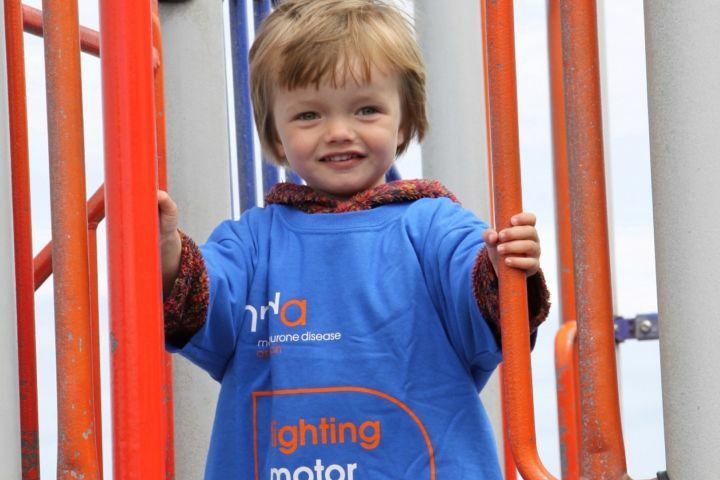 Their aim is to raise £10,000 towards the MND Association and £10,000 towards the new St David's Hospice in Holyhead. Over two months they will cycle 5500 kilometres, cross 14 countries and climb 4 mountain ranges! Click on their Facebook page to find out more and if you can please donate to support them. 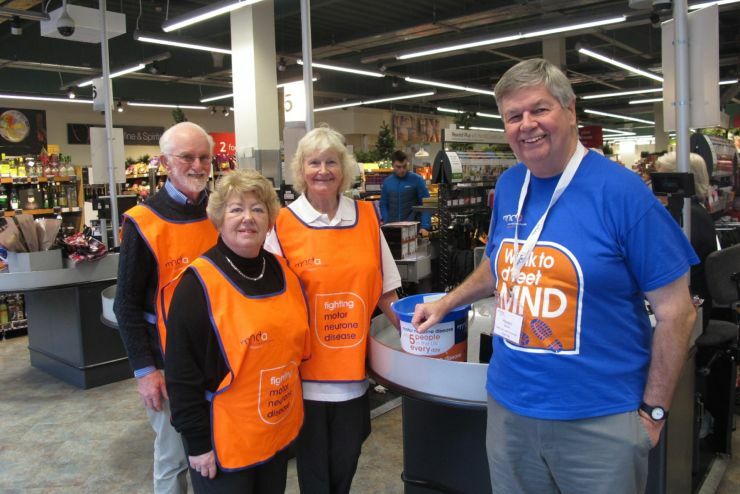 Thanks to Pat Jones (Charity Champion) for allowing us to collect for the North West Wales MND Support Group at the Bangor Tesco Store on Saturday 2nd February. The customers were ever so generous on a cold and frosty day and we raised £992.01! We have a brilliant team of volunteers who deserve a huge vote of thanks especially Roger who travelled by bus to Bangor and from the Town Clock to Tesco by wheelchair (and back to base)! Also, on Monday 4th February our stall of donated items at Ysbyty Gwynedd raised £173.25, making a grand total of £1,165.26p! 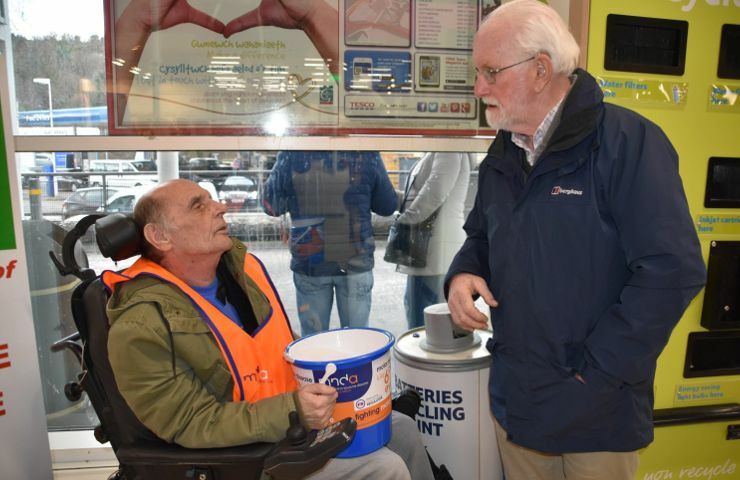 UPDATE: On Friday 15th February our hardworking volunteers were at Tesco Caernarfon where £517.62 was raised, bringing the grand total for February to £1,682.88! Thank you very much to everyone who supported our collectors. Thank you to all the customers at M&S Bangor who gave so willingly and generously during our bag packing event on Saturday December 1st. Thank you also to the manager and all the staff for their warm welcome. The total donated came to £506.46! The North Wales MND Care Cooordination Service was launched in February 2017 when Kathryn Lancelotte and Angela Mitchell began working as MND Care Coordinators. They are employed by Betsi Cadwaladr University Health Booard (BCUHB), funded by a MND Association Ice Bucket Challenge innovation grant. The funding ran until October 2018 with a commitment from the Health Board to take up the funding if the service met agreed objectives. supporting people living with MND during periods of hospital admission and reducing length of inpatient stays. 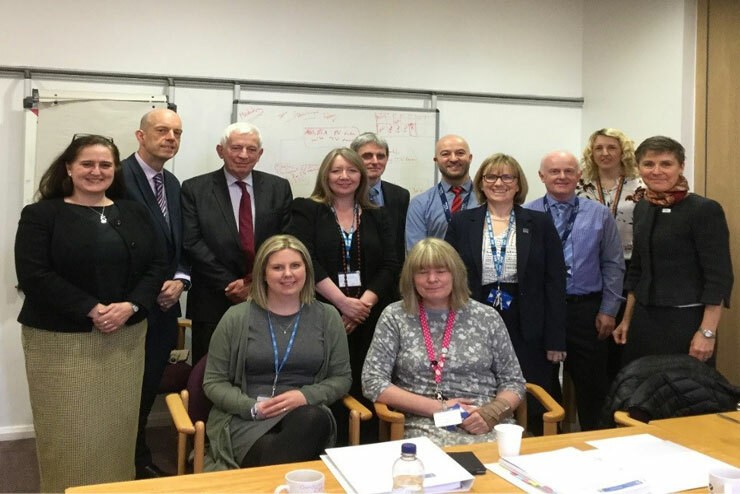 All the objectives agreed were met within 13 months and a process to agree ongoing funding from the Health Board began on 13th March with a presentation to senior representatives of the Health Board supported by Sally Light, MND Association Chief Executive. Further tough funding meetings were held with various decision-making groups within the Health Board before ongoing funding was confirmed on 5th September. Whilst we celebrate the continuation of the MND Care Coordinator posts, we are not complacent, recognising that there is still much that we can do to continue to improve MND services in North Wales. The MND Care Coordination Steering Group continues to meet and new objectives are currently being agreed with the Health Board. We are fortunate that the Health Board recognises the expertise and knowledge within the MND Association and has asked Kevin Thomas, RCDA, to continue as a member of the MND Care Coordination Steering Group. We have a new JustGiving page to raise money for our group! 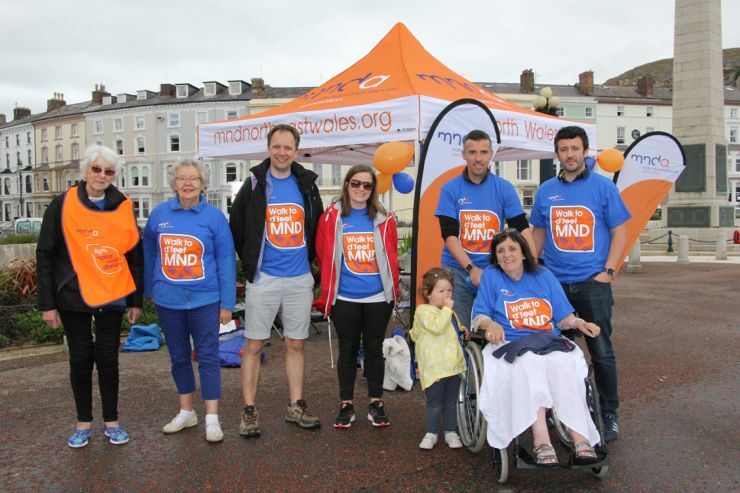 If you would like to make a donation to provide support to local people with MND, their families and carers, then please click here.